We have a new contributor here at Ruffles and Stuff! I was "approached" recently by a hopeful young crafter looking to make her way in the blogging world. (Or at least Mommy's blogging world.) With her fresh outlook and youthful ideas, I thought Paige would be a great fit for out site! You'll see her pop in once in a while with ideas for our younger crowd. Crafts for kids by a kid. It should be fun! For her first post she wanted (read: begged for days) to decorate her own socks. Seriously, it's been the first thing she's asked for every morning for three days. We had a great time! And yes, she did do them herself(with a little guidance from mom). She even took some of the photos! So here she is, in her own words. Take it away, Paige! "Good morning guys! Girls and boys! My name is Paige. I am cute and I am very funny and I eat a lot of chicken peas (chick peas). I am five years old, and my mama is four. Hehe. I was just tricking you. I like to play with balloons and my bear. Oh! And also I like to read Elephant and Piggie books! I like to build, too. And sometimes I steal Daddy's hat when he has it on his head. I wonder if it is a church day today. Everyone: I have made my own socks. I made these socks. Me and Mommy, I mean. Socks are pretty. I showed my friends. They have little stars! My favorite pair are the ones with the hearts. First you buy some socks, and then you paint. You get a stencil, if you have a heart stencil, and then you get a yellow or an orange and you paint inside and when you're all done painting it, you take it off. If you have a dryer you dry it. But it doesn't dry right away so you have to let 'em dry. Why should you make them? I dont know. As a gift? It is a beautiful day. I love you. I'll see you later! Squeeze some fabric paint into a small container. 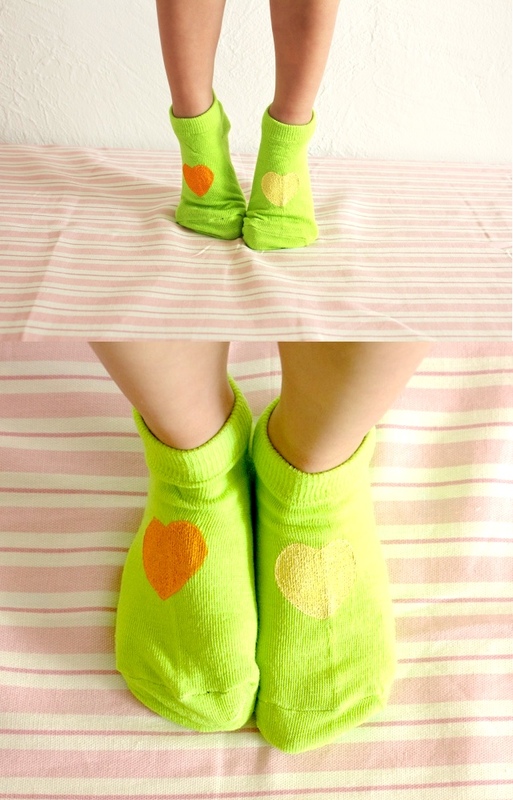 Place a stencil onto the side or front of your sock. Hold the stencil firmly with one hand (or have a parent hold it) while brushing on paint with the other. Dry with a hair dryer and enjoy! Have a parent cut 9 circles of t-shirt material for each sock. 3 large, 3 medium and 3 small. Pull thread through a darning needle (or plastic needle) and tie the ends together in a knot. Put three circles on top of each other (smallest on top) and pull your needle through the middle from the back. Pull the needle back though the circle flower and then through your sock. Repeat 2-3 times. Repeat steps 3 and 4 to add the other two flowers. End by tying a knot in your thread and clipping with scissors. I hope you have fun with Paige's first tutorial! This idea is probably best saved for the 5 and up crowd with adult supervision, but she will share a craft for younger kids next month. Please feel free to leave a comment for Paige! I will be sure to read them all to her. And from me and Paige both: Have a wonderful day, everyone! These are AWESOME!! I love your idea. I will show these to my 7 year old girl, Darby Sue. It looks like a project she would enjoy doing by herself. Thanks for the tutorial. I'm a nanny for some little girls and I love your sock decorating idea. I think we will do it tomorrow! I hope you have some more fun ideas, because as you know, a new craft is waaaaaay more fun than an old one. Thanks! McKenna and Maya will thank you, too! This is so adorable. Well done, Paige! 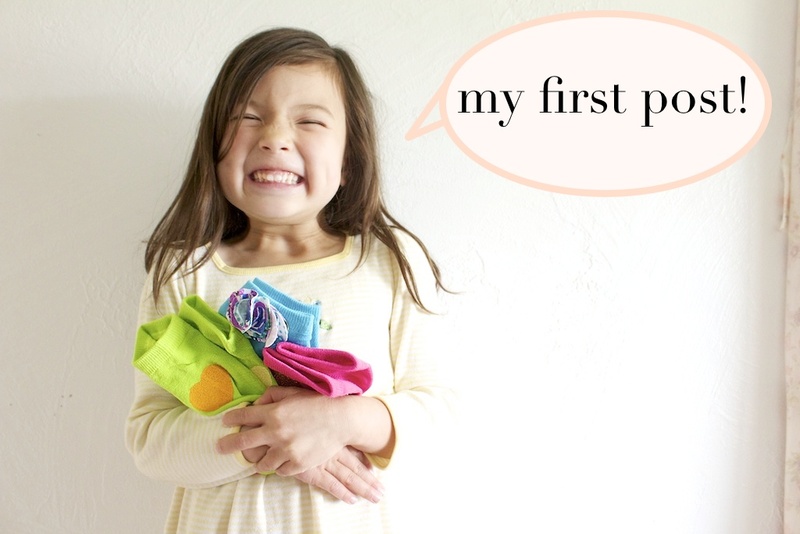 You're going to be a great blogger, just like your mommy! Lovely idea! thanks for sharing Paige. We're happy to hear from you! PS. My (3 year old) son thinks I'm 5 years old. Congratulations Paige for your first post and DIY. Your socks are beautiful and I love particularly theses with fabric and theses with a star. You did such a great job with this craft project! My best friend loves silly socks, so I have to make her some now. Thank you! Paige, I love your tutorial. I think my boys would like these with lightening bolts or trucks. They are still a little young to do this themselves but I bet they would enjoy wearing them. We can't wait to see more of your incredible ideas! I love your first project! You are so sweet and beautiful, just like your mommy! My daughter would think you are the coolest. Hope you have a happy day! Awesome...I would love to see some more posts from Paige..she is so smart :) Thank You..
One of my favorite post so far! I think you've found your star contributor! So cute! Good job Paige! You had a fun and creative idea. I want some star socks just like yours! I love you too Paige! Love your tutorial Paige! And the photos are great! My boys are 5 & 3 and they would have fun decorating socks. Thanks for the fun idea :) Looking forward to your next post! Awesome job, Paige! You have such a cool mommy to let you do that :) Hope to see more of your tutorials on the blog! What a great craft and post Paige! I know my kids would love to do this. Can't wait for your next post. Nice job Paige! My daughter, Lily, is five too and I know she will love to try this! She is silly and likes to wear crazy, mismatched socks. Do you ever do that? Thank you for the great idea! Can't wait for the next one! As an early childhood teacher, I was so thrilled to see this post! I LOVE this! What a fabulous idea. :) Great job, Paige! Paige, you did such a good job with decorating your socks and modeling them. Thanks for showing us how you made them. Yes, you are a cutie. What a great tutorial Paige!! I think the socks are so super cute!! This would be a great project for this summer. :) Thanks! I have a little girl named Grace. She is 4. She hates to wear socks but her feet are ALWAYS cold. Today I think I will let her paint some like yours (maybe the heart ones, they were my favorite to). And I think she might wear them now that they are pretty. What do you think? Will it work? Will she like her socks? I think she might. Thanks for showing us how to make some. Paige: I have a 5 year girl who would love to do this, thanks so much for sharing your ideas. The flower embellished are my faves. Disney: Where do you edit pictures? Hi Paige, my name is Kirsten! Your socks are really pretty! My mommy and I are doing a blog series for Summer, called "30 Days of Summer Fun!" We are making lots of crafts for kids. Would you do a craft? We start our crafts on Monday. I love your socks. You are pretty. I love you. I love your idea of giving Paige a post every month! We would love it if you would consider allowing Paige to do a featured craft for us in June! It would work so well with my series. Kirsten very much enjoyed Paige's tutorial and is excited to try the socks for herself as we begin school shopping this Summer. Thanks again for all your great ideas!! Congratulations to the new blog contributor, and is very nice, socks are adorable. Congrats Paige! What a great craft idea, instructions, and pictures. :) Can't wait to see more projects! Love it! Way to go, Paige! Wow! I'm really impressed with Paige's skills both at crafts and photographying!!! Well done :) and I can't wait to see more of Paige's ideas! Beautiful socks. Paige! I look forward to your next post! Paige, this sounds like so much fun! Thank you for the great idea! Gorgeous work, Paige! My 5 yr old son, Jonah, wants to paint dinosaurs on his socks! Thank you for showing us how. Keep up the great work! I LOVE this post Disney and Paige! I am very impressed with Paige's idea and the results. Good job! Pear and Jovie will be doing this soon. I can't wait to see more posts from Paige. And as always, Disney, I look forward to your lovely and creative posts. Paige you done an awesome job at both the socks and your blogpost. Keep up the good work. Sometimes when I want to do a quick project for a little girl I buy puff paint at the dollar store and write their name or make a little picture on a t-shirt. You can do it on a cloth bag too. It isn't very expensive to do but it is a lot of fun. I think you might to try that some day. Have fun crafting. I was 5 when I started crafting and now I'm 50 and I am still loving crafting. What fun! I have two girls who are going to be putting this on their summer craft list! :) Thanks Paige, and great job! she came up with this on her own? and my mom LOVES ankle socks. so i could make her some.... :) cool! Paige! You are so fun and creative! You are a lucky little girl to have such a fun mom to do crafts with you! My daughter Charlotte is 3.5 and she would love to make these! Great idea! Paige, you and your mom are so smart! What a great craft! I have a little boy, but I think he would love this with boy stencils and boy colors. Thank you for such a good idea! Wonderful and exciting first post, Paige! I love all the socks, and I think the hearts are my favorites, too. I hope you start planning some more crafts to show us, because I know they'll be fab fab fab! Yay! Good job, Paige! What a fun idea! Wow Disney. You and Paige are just a fantastic duo! Love the kids craft idea, and my 4 almost 5 year old girl loves the painted socks! Great tutorial. Hi Paige, you made adorable socks and you are adorable yourself too! I love your first tutorial! When my little girl is a bit older I'll definately make them with her! Looking out for your next tute! Oh my goodness!! Miss Paige this was soo great!! I can't even believe you are 5! Your mommy and Daddy must be so proud of you, because I am and I am only a reader! Keep up the good work, and maybe you can do this again!! Oh dear this was so cute! Paige you're such a clever girl! Thank you very much for showing us how to paint our socks!! Dear Paige, I really like your socks. I think they came out super cute! The hearts are my favorite because I know my daughter Chloe (who is 5) would like them a lot. I also like the flowers too - because my 3 year old named Madeline loved flowers, and she would wear those. And the stars make me want to make a wish. Thank you so much for working so hard to make this great post. Now I know how to paint socks! Thank you! I will share these with my five year old daughter. Her name is Maggie Mae and I have a feeling she will like them. I think she will like them even more because a five year old little girl like her made them!!! wow, Paige is so talented!! Awesome photos and I love the description o how to paint the socks! Looking forward to the next post! Oh my gosh, Paige, that is fantastic! I love your idea! Paige, you are SO cute! And I have the exact stencils you do -- because I grew up in the '80s and had way too much Tupperware in my home. :) Keep the posts coming! Paige, you are adorable and this is a great tutorial! So fun and fresh and something I think my kids would love to do. Great idea!! Paige, Thank you! My little girl and I will really enjoy doing your crafts together. Plus we really needed a good idea for how to make some fancy socks that aren't too pricey, so this is a very practical craft for us too!!! Wow Paige! you're such a clecer and creative girl! very very veeeery well done! All the best for the next project Paige (and Paige's mom), can't wait for it. Love your new socks. Such a smart idea and fun to do! I wish my mum would have had a blog by the time I was Paige's age... I loved to do crafts! Love PaigeCraft!!! I don't have children but taught 3-5 yr olds at church for years. This post is cute and fun, but will be an incredible memory for you and Paige when she gets older. Save it to show her fiance someday. I just love your socks! My favourite ons are the pink ones with starts. well you did such a good job!!!!! My daughter, Alexandra Paige ,is all grown up, but she would have loved making these when she was younger! Keep crafting! You are a natural. P.S. this would be a great craft to make at Bible school or a Girl Scout meeting. What an awesome idea Paige! You are so talented, just like your mommy! Can't wait for your next guest post! Loved your tutorial Paige! You done such a good job! I think I will make my socks just like yours! Thanks for the idea Paige! Aaliyah P.S. Check out my blog! So cute! I love the personality! How fantastic! She did a great job and her pictures look so professional. What a great Mom you are for allowing Paige to be so creative and blog about it. Kudos to you! My six year old and I have been trying to come up with ideas for summer projects. I think this would be one we could do and even her little sister could work on a pair or two. Thanks for sharing! Paige! You did such a great job with this craft! I want to make them for myself and my little girl (she's two, so she's too little to make them herself). How adorable is she!!! Just like her mama. I can't wait to share this and future Paige Craft posts to my little ones. Thanks for sharing your craftiness Paige! Your daughter is honestly the most beautiful little girl I have ever seen! You are so luck, and she is so smart for a five year old. Do you homeschool, she seems to be quite bright? Does she get her smarts from you or her daddy or both? 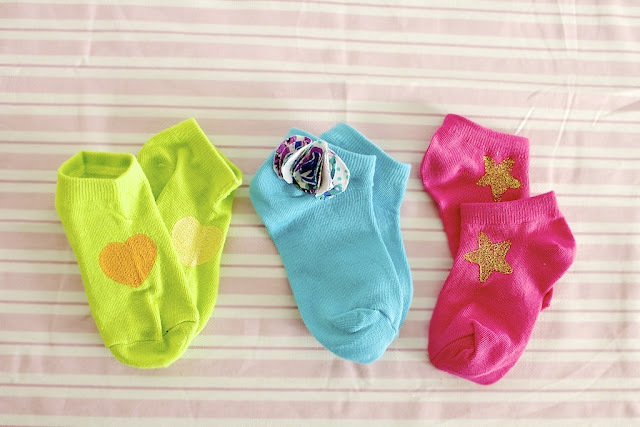 Such an inspiring blogpost Paige, I want to wake up for three days asking to make these socks. Paige - My mommy was a really fun, crafty lady too. She taught me so many things, how to make clothes, how to bake cookies, how to paint, and others. I like that you are expressing your creativity and can't wait to see more of your projects! Paige, thank you so much for sharing this idea! This will be a perfect project for me and my two little girls this week. They are four and two, and I think they'll be very excited to have such a fun project to work on this week! Thanks again! This is one of the greatest ideas ever! Your little lady is indeed a doll and what a fun thing for her to do. I also, hardly get any comments on my blog but when I do I def appreciate them. Sometimes I think of giving up blogging all together but then I remind myself I don't blog for comments, I blog for inspiration. I can't wait to see Paige's next craft! Thank you for sharing your idea. I especially like it because the stenciled socks could be used for a boy too! So many crafts are just for girls. I can see it now. Blue socks with yellow stars. Red sock with baseballs or footballs. Green sock with trucks. Thanks for the idea! Love! Paige, you are an incredibly talented crafter! My kids are going to love making their socks! I had those same stencils as a kid! I'm 22 now, and I still use them. Girly project for the weekend!! :D looking forword to more posts and neat crafts from you..